he went on to spend 2 years in Japan studying Martial arts and Sumie Painting. 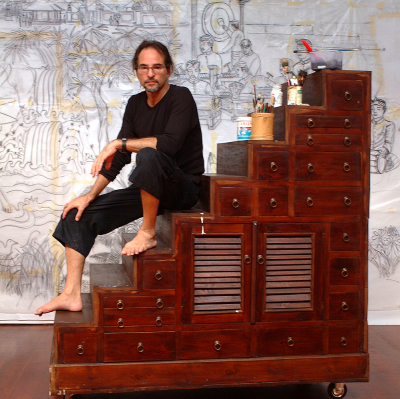 During a brief visit to Bali, where he collaborated with talented Balinese craftsmen he saw the opportunity to create art by merging his contemporary sensibilities with the traditional Balinese craft of stone carving. 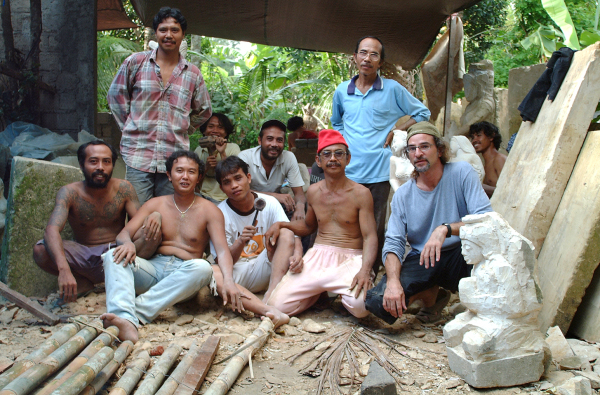 Master Stone Carver Made Sumarya (standing upper left) is a fifth Generation stone carver. He leads team of over 40 of the worlds best carvers and trains his sons in the art. Under his guidence the ancient art continues to flourish. He has been working with Art in Stone since 1989. Our projects have brought members of our team to Europe and various projects in Asia and Australia.